Rain washes off the heat of the day. It’s a nothing storm, a band of dark clouds that spills sunlight through the cracks. We shrug on jackets when the first drops fall and shrug them off again as it passes, grateful for the cool air. 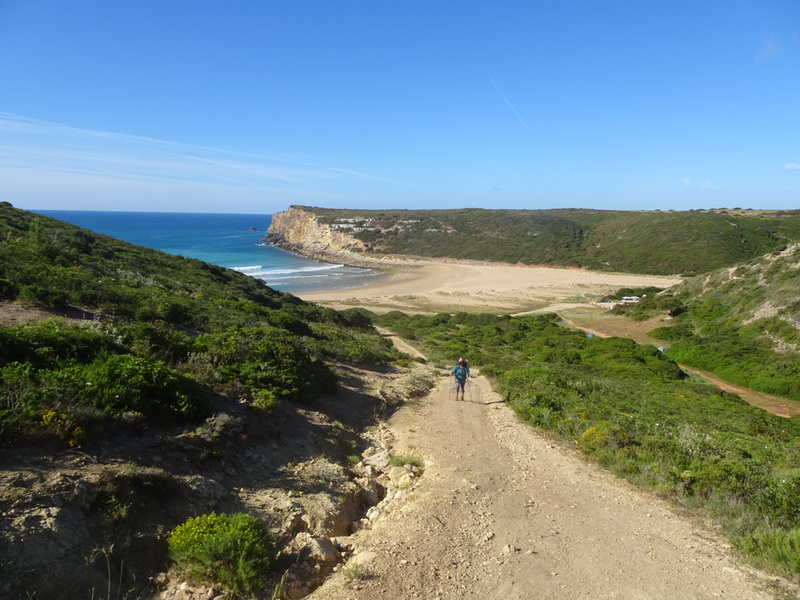 The Rota Vicentina is gone, left on the western coast at Cabo San Vicente, so we keep the ocean on the right and follow a mix of footpaths, roads, and highways. Some work along spectacular cliffs and across hidden beaches. Others are just pavement and cars. The wildness of the coast fades with every step. The small villages seem a bit closer together, buildings a bit taller, houses a bit nicer. We hear more English in the streets and see more tourists baking like red tomatoes in the sun. Over a spectacular cliff of yellow and white, with the sun streaking through the broken clouds, we reach Lagos on tired legs. Daya agrees before the question is out of my mouth. It’s been three weeks since we explored Porto on our last day off. It feels like a lifetime. I only move to eat for the next 36 hours. “I only move to eat for the next 36 hours.” I’ll Bet!!!! !